For the past two years I’ve been steadily ploughing through George RR Martin’s A Song of Ice & Fire books – as you almost certainly know, this is the epic fantasy saga from which the TV series Game of Thrones is adapted. It begins with A Game of Thrones, then proceeds with another four books, although two of those books are actually split into two volumes each, so effectively we’re talking about seven physical books in total, which range from around 550 – 800 pages each. Apparently, there are likely to be two more books, each split into two volumes once again, before the series is complete, which means we still have at least another two or three thousand pages to go before the whole story is complete. Plus, none of the books has an overall story arc of its own; they’re very much just instalments rather than standalone stories. What I’m trying to say is that I’ve had actual paid jobs into which I’ve put less time and commitment than I have into A Song of Ice & Fire. Clearly I wouldn’t have put this much effort into reading a series I didn’t think was any good, so I don’t have to tell you that I liked them – even though, generally speaking, I’m not a great fan of high fantasy at all. When I read fantasy, it's usually the low kind. As a child I liked TH White’s The Once and Future King a great deal, and Ursula Le Guin’s Earthsea books, and The Hobbit. As an adult, however, I never managed to get into authors like Raymond E Feist, or Robin Hobb, or Robert Jordan. I didn’t even like Lord of the Rings very much (I know). The thing is, though, A Song of Ice and Fire doesn't always read much like high fantasy at all. Although it’s set in the fictional continents of Westeros and Essos, they are broadly similar in geography and climate to Europe (or even just the British Isles) and, say, the Middle East. And while there is some magic, there’s not a great deal of it, especially in the earlier books. It certainly isn’t part of the characters’ everyday lives – generally, in fact, they are as sceptical and wary of it as we might have been in our own Middle Ages. Generally speaking, these books felt more often like a historical epic than a fantasy one. The story begins with King Robert Baratheon ruling the Seven Kingdoms of Westeros from the Iron Throne, having previously deposed mad King Aerys, whose Targaryen family had united Westeros centuries previously and presided over it ever since, but who have been weakened by the loss of their dragons and by a streak of insanity caused by inbreeding. The Starks were the Baratheon’s greatest allies during the rebellion, and are now ‘wardens of the north’, keeping an eye on the wild and remote expanse of Westeros that borders the frozen, lawless wastes ‘beyond the Wall’. Lord Eddard Stark and his daughters travel south to the royal seat of Kings Landing so that Eddard can take up a post as ‘King’s Hand’ – essentially, King Robert's deputy and administrator who presides over his Council – and his daughter Sansa can prepare to marry Robert’s heir, Prince Joffrey. Married to King Robert is Queen Cersei, of the immensely wealthy and unprincipled House Lannister – and it’s the Lannisters that Eddard suspects are plotting to eclipse House Baratheon as the royal family of Westeros. Meanwhile, Robert has two brothers, Stannis and Renly, who may also have a claim to the throne, and overseas, the exiled heir of the Targaryen dynasty, Viserys, is brokering a marriage deal for his sister Daenerys that could see him acquire sufficient wealth and manpower to win back the Iron Throne by force. In the far north, the politically neutral Night’s Watch defends Westeros against the lawless ‘wildling’ tribes the immense Wall and its garrisons were built to keep out. As the series goes on, battles are fought, strategic marriages are arranged, uneasy alliances are forged and shocking betrayals take place – even the lengthy summary above is a vast simplification of the basic premise. The whole series has a huge cast of characters, made all the more extensive by George RR Martin’s insistence on naming almost everyone we meet, whether they appear for the entire saga or for two pages. The important thing is not to worry about this. You will not remember them all, and you don’t usually need to – when you do, you will. What having these minor characters’ names does do is give us a great sense of the interconnected nature of the ‘Houses’ that are fighting for the Iron Throne, and the smaller families who are loyal to them. While it can be bewildering (pick up one of the later books and look at the list of characters in the back, if you don’t believe me; it’ll go on for twenty or thirty pages) it does make the world of the books feel extremely real, and gives us a strong sense of the colossal implications of every shift in power or change of allegiance that occurs. There are many characters that we do get to know extremely well, not least because there are chapters from their particular points of view. These characters develop realistically; there are no real heroes here and very few unmitigated villains. Even the most heroic characters do some terrible things and have some serious flaws. Most notably, George RR Martin has absolutely no qualms about killing them with little warning, not only wiping out some of the most popular and prominent characters in the series but also completely changing what you had previously assumed would be the course of the plot. There are multiple occasions during this series where I realised that this was not going to be the story I thought it would be: viewers of the TV series will have had a similar experience. This is a remarkable tactic and one which makes the saga particularly tense and gripping – although it's also a brave one, as it means Martin is relying on people sticking with the saga for thousands of pages even after their favourite characters, in whom they have been emotionally invested and have assumed will play an ongoing role, have abruptly disappeared. The first three books in the series are, for me, the strongest, with book four, A Feast For Crows, being by far the weakest. What all later books need is a damn good edit; the digressive detail, long prologues etc do become a little absurd, and because we now have so many characters given points of view, some of the main players are affectively abandoned for hundreds of pages at a time (or in the case of A Feast For Crows, the entire book). The timeline is become increasingly complicated, with the first half of A Dance With Dragons taking place simultaneously with A Feast for Crows, and the second half reconnecting with that narrative and moving it forward. Occasionally, a great deal of time will be spent on subplots in which I didn’t feel particularly interested - I don’t care what goes on in Dorne and the Iron Islands, distant corners of Westeros which have always hankered for independence, for example, and although those plotlines do influence the rest of the story, I don’t feel there was any need to dwell on them for numerous chapters: there does come a point where parts of A Song of Ice and Fire start to feel a little like a sort of fanfiction of itself. Much has been made of the violence and sexual content (and sometimes the combination of the two) in the Game of Thrones TV series. If anything, the books have slightly more of both, although rendered in a way that’s far less gratuitous than in the television adaptation - the books don't have the TV series' notorious 'sexposition'. I did, however, feel that Martin was trying to out-gruesome himself in the later books. Although he does this remarkably well, it can occasionally become tiresome - not particularly disturbing, simply a little predictable and lazy. Accusations of misogyny have also been levelled at both the books and the TV adaptation, although I personally don’t find this an especially meaningful criticism. These are novels set in a pseudo-mediaeval world; women lead, by and large, the sorts of lives you’d expect them to lead in this culture and environment and are subject to the same abuses and prejudices. There are characters who actively despise women, certainly, and there are characters who have misogynistic attitudes simply because these were prevailing attitudes of the time, but we as readers are clearly not expected to condone this and the narrative overall doesn't present it in a positive light. At the same time, women in A Song of Ice and Fire play a stronger and more active role than they would in many novels of a similar genre or setting. There are numerous female warriors, for a start, from Arya Stark and her swordfighting lessons to Brienne of Tarth, essentially a female knight. Catelyn Stark, Cersei Lannister and Lisa Arryn are cunning political negotiators as well as formidable matriarchs, and Daenerys Targaryen rapidly develops into a young woman of immense strength, power and resource. The mysterious sorceress Melisandre may well prove to be more powerful than Stannis Baratheon, the heir she serves, and even Sansa Stark, who begins the saga dreaming of marrying a handsome prince, has a particular talent for self-preservation and inner strength that develops nicely as the story unfolds. In terms of the actual prose, there's the odd bit of cliche, the odd bit of cod-mediaeval language that made me wince a little, and the occasional irritatingly jarring Americanism, but in an epic of this size, these are remarkably few and far between and in general, the writing is richly descriptive and draws the reader powerfully into the books' world. The scale and scope of A Song of Ice & Fire is, however, clearly mad. There are so many characters, so many plot strands, so many digressions ... and so many pages still to come. The entire sprawling wonder is as much sort of crazed, violent, fantasy soap opera as anything else, Do I have a clue where the overall story arc is going? No. 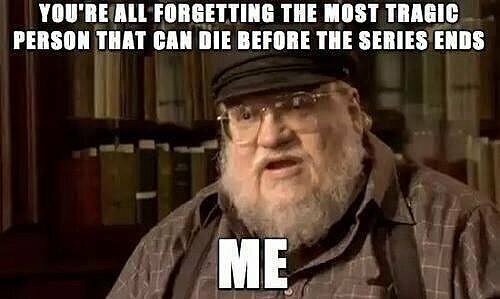 Do I think George RR Martin knows either? Probably not - it wouldn't surprise me in the least if it never came to end, with George chuckling on his death bed at having got away with it all, still wearing his excellent, trademark 'fat guy hat' . But honestly? I'm not sure it matters. I'm happy to stay along for the ride.